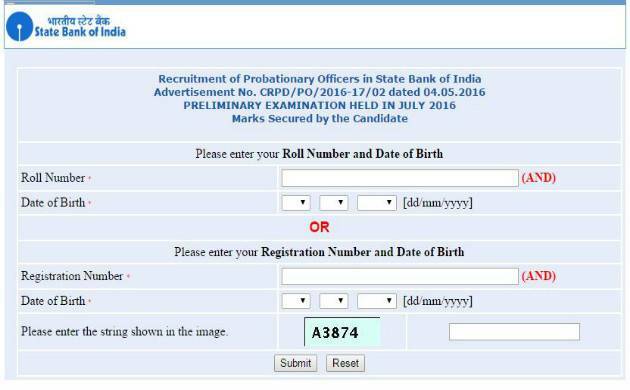 India's largest State run, State Bank Of India declared its probationary officers (PO) preliminary examination results on July 17 2016. The SBI PO Prelims results can be seen at its official website www.sbi.co.in. The advertisement made for the recruitment of probationary officers on (CRPD/PO/2016-17/02). According to the advertisement report mentioned it is said that candidates can download their call letters for the Online SBI PO main exam from July 21 (onwards) which is scheduled to be held on July 31 (Sunday). All the candidates who appeared for (PO) preliminary examination are advised to take a print out copy of their results for future purposes. The SBI had earlier conducted PO preliminary examination toinvite interested and eligible candidates for recruitment to their 2200 posts of Probationary Officers (PO).